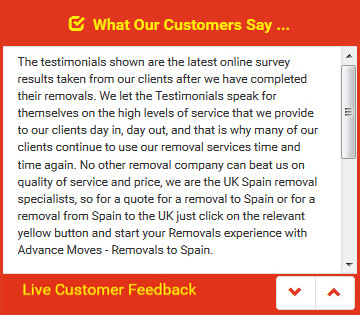 Removals From Spain To UK - Relocating To The United Kingdom? Whatever reason you have for moving back to the UK, transporting all of your belongings by yourself will be a difficult task, and hiring out a van for removals to the UK is much more expensive than you might think. Using our quick quote form, you can get an estimate for how much your move will cost, which you can compare with the cost of hiring a van � as well as other fees involved in moving goods alone. Not everyone who has moved to Spain chooses to stay forever. It may be that you have to move back to the UK for financial reasons, for work, or because of health or family issues. Whatever the motivator, once you�ve built your life overseas you�ll probably find that you have a new load of possessions you wish to take back with you, and moving these items will be hassle. - Does the site look professional? - Are the methods of packaging laid out? - Does it offer guarantees or insurance? - Are there positive reviews from previous customers? Chances are you�re working to a strict budget, and don�t want to pay over the odds for a removal service: however, the best way to work with this is to get a solid quote, which can only be achieved if you know the volume or weight of all of your goods. A good way to do this is to work around the home, listing your large and small pieces of furniture. Some removals company will encourage you to break the list down by room, and offer prompts for items you may have forgotten, such has those in the garage. The more detailed your entry, the more accurate the quote. If you have this information, you can enter it on our Quick Quote page. Here at Advance Moves, our goal is to lessen the stress of transporting your furniture and goods from one country. Our speciality is for removals from Spain to UK and UK to Spain, although we also offer inner-country removals. We are also recognised by the British Association of Removers for our excellent work. Use our Quick Quote page now to see how much our professional and elite removal services will save you.